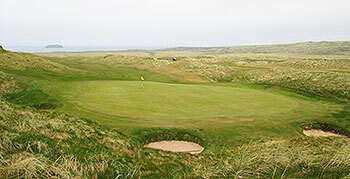 Ballyliffin is Ireland’s most northerly golf club, located off Tullagh Point on the Atlantic edge of the Inishowen Peninsula. It’s difficult to pin a date on the earliest origins of the game of golf at Ballyliffin, but it is clear that the Ballyliffin Golf Club was founded in 1947. The Glashedy links is, however, much, much younger. In 1991, the Captain of Ballyliffin, Cormac McDonough, put a proposal to the committee to alleviate pressure on the overplayed Old course. The result was that Pat Ruddy and Tom Craddock were commissioned to design a new course on the finest links land they had ever seen. Work started in spring 1993, and after significant earth-moving, the Glashedy links (pronounced Glasheedy) – named after the Glashedy Rock, Ballyliffin’s equivalent of Turnberry’s Ailsa Craig – opened for play in the summer of 1995, to much acclaim. Ballyliffin is often described as “the Ballybunion of the North” or “the Dornoch of Ireland” and the reason is simple; all the aforementioned are set amidst towering natural sand dunes. This youngster is no exception, except that the Glashedy links has been flattened out, ensuring that the fairways are relatively even and capable of hosting a championship... there's a parallel here to the fairways of Royal Birkdale. 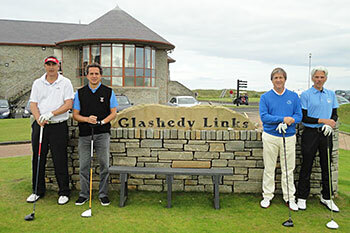 The Glashedy links is certainly good enough and long enough to hold important championships and already it has hosted the North West of Ireland Open. It would be fascinating on a windy day to watch the very best professionals stretched to their absolute limit on this wild and challenging links course. Surely the Glashedy links must be a contender for a future Irish Open Championship. Pat Ruddy provided the following update at the start of 2017: Upgrade work has been carried out on the Glashedy course, where a bid to host the Irish Open is in the offing. New additions include championship tees (adding 40 yards and slightly angled lines) on the 2nd and 9th holes and new fairway bunkers on the left of the 1st and 3rd. On the final Sunday of the 2017 Irish Open at Portstewart Golf Club it was announced that Ballyliffin's Glashedy course would stage the 2018 Irish Open, which Scotland's Russell Knox won after beating New Zealand's Ryan Fox in a play-off. Expectations were high given the upcoming Irish Open and the many positive reviews associated with the golf club. The course starts out with a string of tough par 4s moving away from the clubhouse, but they showcase how penal the course will be. The bunkers (as they should be) are true deep hazards which essentially eliminate making a par if you find one off the tee. The course doesn’t give you many chances to score or make birdies, and in places feels like a slog – especially with how punishing the bunkers are. Outside of the splendid collection of par 3s, the course didn’t visually appeal to me or make me stand in awe. The surrounding scenery and coastal beauty is obviously outstanding, but the spirit of the holes themselves didn’t offer up the same charm for me personally, and subsequently didn’t jump out as memorable. We played Glashedy yesterday in even stronger winds than the previous day, up to 40 mph. We nipped out early thanks to the friendly staff to take advantage of the lovely sunshine and had a great fun game of golf in very challenging conditions. I very much doubt that human hand will find either of the golf balls that I attempted to drive on the 4th with the wind blowing from the left. A relatively gentle start introduces you to a clearly modern links but with the sense of fun retained. The views are amazing from the upper ground with a great sense of isolation. The par 3's were all downhill leading to some peculiar shot making. Would love to return on a better day, the closing stretch into the teeth was a zig zag grind, bringing to mind PG Wodehouse's description of an Atlantic Convoy avoiding U-Boats. A great place to stay for a couple of days and enjoy 2 very good golf courses which we couldn't split on ranking. Just back from 36 holes on the Glashedy and Old is there any better setting in golf? absolutely magnificent 2 days of golf mountains, sea, rainbows and of course spectacular golf holes everywhere! The welcome as always was legendary from the young ladies in the Pro Shop to all the staff in the bar and the tremendous and welcoming starter sincere apologies for not remembering his name it must have been the black stuff! I have played golf all over Ireland during the past 25 years and Ballyliffin is without doubt the best 36 holes of golf in Ireland no contest. If you combined the best holes on the Glashedy and Old you would have Ireland's number one golf course. This is a very special place and if you are a links lover this is the ultimate links experience do not miss it. Wishing the club every success with the Irish Open in 2018 a great recognition for the best 36 holes on the planet! Early in the morning, we teed off on the Glashedy. The opening holes are short-to mid length par 4’s and all great holes. Positioning off the tee is of great importance and the greens are well protected. The second hole is the loveliest of the three. The fourth hole changes the direction heading towards the sea. From the new backtee, the views are breathtaking and the landingarea seems small. For us mere mortals however, this hole is the first birdiechance of the day , as a good drive leaves an approach within shooting range. You will have to clear a large swale in front of the green, or lay up. I found these awkward shots to play very difficult at Ballyliffin. The greens are firm and fast and the contours of the green as well as the wind can have a great deal of influence on the flight and roll on your ball. The fifth is a lovely little false punchbowl par three en the seventh is where it really starts to get serious. Good luck with the club selection! Very good golf course. Played the Old in the morning and Glashedy the afternoon. This is a brilliant 36 holes of golf. Considering the courses occupy the same land, they are very different in topography and conditioning, with Glashedy feeling “newer”. I would urge golfers to play both courses at this top resort. For me, there will be three reasons to return to Ballyliffin: (1) The absolutely drop-dead gorgeous setting so no matter how you score, there is always the scenery to admire, (2) you can play at your own pace as it is rare to find both courses blocked by fourballs at the same time and (3) the ingenious design of the Glashedy by Pat Ruddy. If you have played The European you recognise a few of his favourite design elements, but that only adds to the pleasure of playing an intelligently designed course in an absolutely fabulous setting. No wonder Ballyliffin has plenty of admirers. It’s been five years since I played the Glashedy. Last time I was here, the club was half way through an ambitious bunker revetting program and, quite frankly, the changes looked a little severe to my eyes. Not to worry now as the sand traps have settled in nicely over time and the course was in absolutely fabulous early season condition today, with greens like large pale green velvet carpets. I was sorry not to be able to speak to head green keeper Andy Robertson about recent course developments but general manager John Farren put me right on a number of topical club matters, such as the revised par three 7th hole and the ongoing coastal erosion problems that Ballyliffin and a number of Irish clubs are facing. I also understand the Irish Amateur Championship will be coming here next year. As the GUI don’t award the hosting of such a prestigious competition to any old dog track, it’s a real feather in the club’s golfing cap to have this premier national amateur event played here. Hopefully, it’ll be the springboard to bigger and better things for a golfing outpost that’s certainly due wider recognition for its golfing excellence. We played both courses in consecutive days, Old on a Tuesday and Glashedy on a Wednesday on this really fantastic 36 holes facility. Again I was honored to play with Paddy the captain on Old and with my irish friends from North and West Coast Links on Glashedy having a great fun match which of course we lost to the locals, but all together it was a great experience. We had a decent weather day, with some short showers during the round but it was fine. The course is totally different from Old, as this one was completely built will the other was just mowed and bunkers placed, which makes it more “natural”. The views are as good as you can imagine, make it the very best when you are at the top of the hill where 7th tee stands: a great downhill par 3 with water in front which is the signature hole and where calculating distance is extremely difficult. First 6 holes are great, specially par 5 4th and par 3 5th in the direction of the Glashedy Rock (similar of Ailsa Craig in Turnberry) and then going back for short and trick 6th, a real jewel. 8-9 go back to the very nice club house before getting away on short 10th. The back 9 are tougher than the front and where you will find many tough holes even the short par 3. 15th is a monster par 4 (into the wind and rain it was driver and 3 wood just reaching the green) and 17th is a very demanding par 5 which usually plays into the wind. The hole back home is a very nice dog leg right where the tee shot needs to be extremely accurate. A very nice experience, a great course and a fantastic club house make it a worthy experience to make the ride up to here. And the presence of Glashedy Rock reminded me a little bit of my loved Scotland! I have played Glashedy 5 times now and have to admit that it is one of the great golf courses in the North west of Ireland. Beautiful fairways and excellent greens that can run extremely fast. I played the course in late September 2010 and on the day they were officially running at 12 on the stimpmeter which for a mid handicapper like me was pretty scary. This course along with the equally brilliant Old course makes for an excellent destination for anyone playing golf in the area. The only small negative I have about Glashedy is the small pond at the front of the downhill par 3 7th hole. It doesnt take away from the course but I just thought that it didnt quite fit in with the rest of the holes but this is a very minor detail. This was definately my favourite course in the area until I played Sandy Hills last week and in my opinion it would just about have the edge over the two Ballyliffin courses.